The info card attached to Brian Schuch's handmade knapped blades brags that they are "sharp enough to butcher a marmot." But we suspect most buyers will want to display them as art. Schuch practices the ancient technique of knapping — removing chips from hard material to make a razor-sharp blade. It's probably the first art form to have been created by our ancestors, and they were good at it. A properly knapped blade could kill a cave bear, carve up a mammoth or trim out an elk hide to make practical clothing. 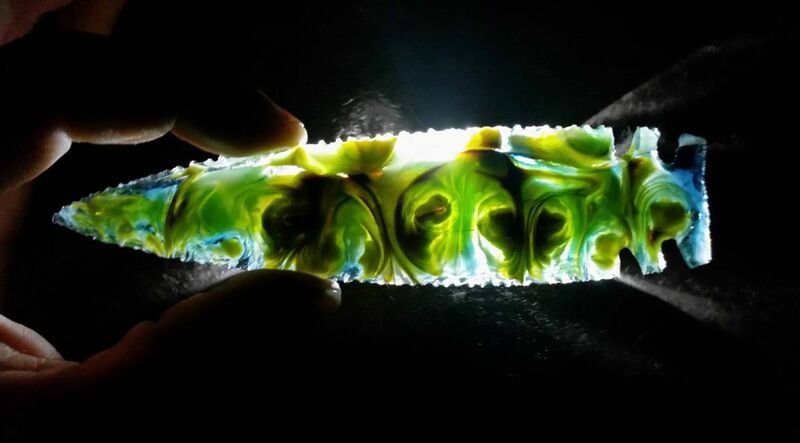 The artist says he uses his blades for hunting and skinning, but he's taken the craft to a new level by using materials other than the traditional flint or obsidian. 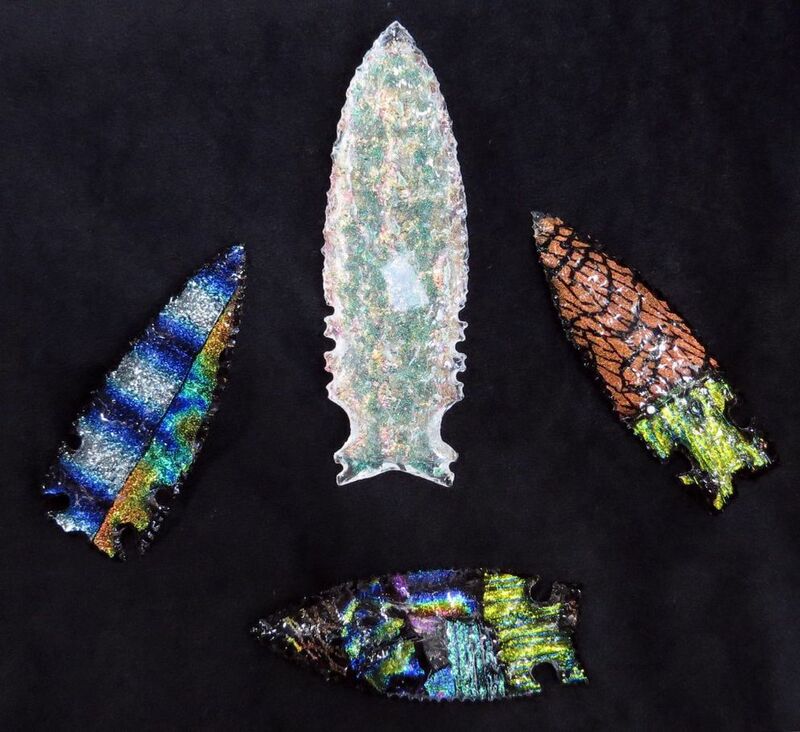 Schuch's points are created from fossil wood and coral, jade, agate, quartz and colorful dichroic glass made by his wife, Sara Chatfield. The term dichroic is usually applied to laboratory equipment, but it also has art implications. Two different layers with different colors are produced as a composite that changes colors depending on the lighting. They also create distinct translucent shapes that add an unexpected dimension to the blades. Schuch's work continues the traditional theme with hafts (handles) and elaborate display stands made from natural materials like antlers and fossil whalebone. The hafts are attached to the blades using pitch, leather and twined nettles. In addition to familiar spear and arrowhead points, the items on display included ulus and a replica of an Aztec battle club — club being perhaps the wrong word, since the shaft is lined with sharp blades. In addition, the pieces include sheaths made from salmon skin or leather. The points are on display this month at Northern Made Creations, located at 1120 Huffman Road. Eagle River artist Laurel Carnahan has a number of whimsical paintings of seal, mammoths, bears, owls and dogs reading books and a raven enjoying a cup of coffee. Carnahan works in an interesting medium; she takes raw silk fiber, dyes it and turns it into paper used for her originals, which often include a collage component. From the originals she creates giclee prints. 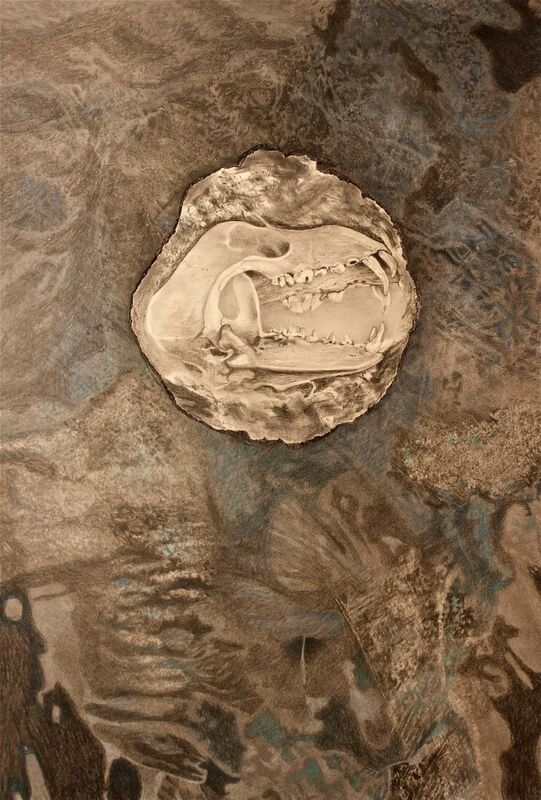 Collage is also the medium of Michele Suchland, whose delightful solo show "Let Them Fly and See What They Become" is featured in Alaska Pacific University's Grant Hall gallery space this month. The title piece is a set of two dozen clay figures arranged into two lines. In one line we have 12 bird forms, some with feet, some with wheels, all surmounted by heads resembling the heads of mammals such as dogs, sheep, rabbits and cats. The other line is a procession of children wearing bird suits. Since the pieces are being sold individually — and some already had the red "bought" stickers next to them on First Friday — this month may be the only chance we get to see the parade. 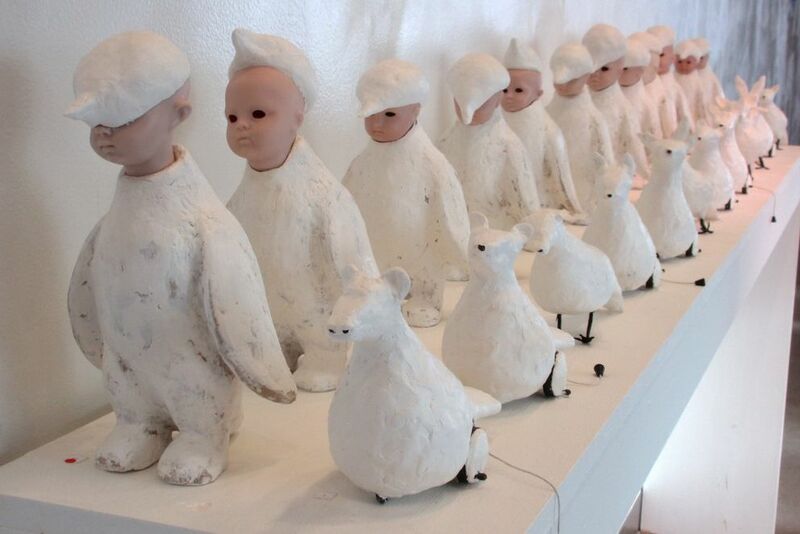 The other pieces on display, mostly in series, have titles that, like the name of the show, seem to refer to child-rearing. "Let Them Play and See What They Create" uses piano keys with numbers, bird silhouettes and the same animal heads. Those heads are also central to the three-piece "Be Afraid for Them and See How They Live in Fear," which are all dominated by the red lenses of stoplights or brake lights. Next door in the Carr Gottstein Building, Don Decker has an impressive collection of abstract work, mostly done in graphite and colored pencil and mostly confined to a palette of black/grey and blue. Separate from the imagery, the technique is fascinating. I found myself squinting close up from sharp angles trying to figure out how the artist was getting a particular effect. "Layers," for example, really does contain two layers of surface. "Thin Ice" is done with some sort of overlay. The impression is that one is looking through something. Well-drafted animal images sometimes pop up, like a raven or a bear skull. Decker was not in town for the opening of his own show, but his artist's statement said the work for this show was inspired by hikes during spring thaws on which he is forced to face downward in order to watch his step. "In so doing, I have grown to appreciate the Zen-like world beneath my feet. Stones, bones, wood particles, feathers and dried vegetation begin to resurface as the sun melts away the cover. Pristine layers of ice and snow become marked by holes and protrusions. The mysteries of the long winter, as animals battle to survive or as the cold and snow deform the flora, are revealed by the warmth of the sun." Botanical paintings by Susan Bremner were displayed at Blue.Hollomon Gallery. But what caught my attention was a large ceramic female head by Isolde Gibson, thin-walled, open at the top and hollow, a wonderful example of careful execution. James Haven's unveiled his 32-foot mural of an ancient sea reptile at the University Center on Oct. 7. The giant canvas depicts an underwater scene and shows a snake-necked plesiosaur and orca-like mosasaur, plus various shelled ammonites and giant clams. Pterosaurs can be seen gliding in the sky above the surface of the water and on the floor of the ancient sea are the bones of a land-dwelling ankylosaur. 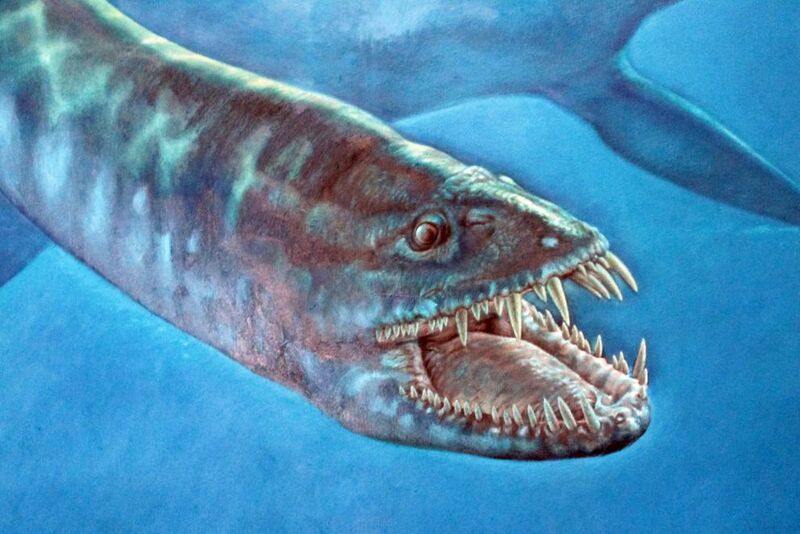 Fossils for all of these age-of-dinosaurs creatures have been found in Alaska, the plesiosaur being the most recent. Haven has also created a model of the animal's head. At the unveiling Yup'ik singer Ossie Kairaiuak of Pamyua performed a drumming and dance piece written in honor of the ancient animals. He'll be repeating that performance at a second open house, 3-8 p.m. on Oct. 22, also at the University Center in the former Natural Pantry location. People who helped in painting the piece, and a lot of kids and others who were involved, are particularly invited to stop by and sign the canvas. Haven said the painting is looking for a home. Anyone with ideas on where such a big picture might be displayed can contact him by calling 808-365-4509 or 808-345-5898. Future First Fridays will be a little less busy next year. Artique Ltd., one of the first art galleries in Anchorage and surely the longest-running at this time, has announced that it will close on Dec. 15 after 45 years in business. 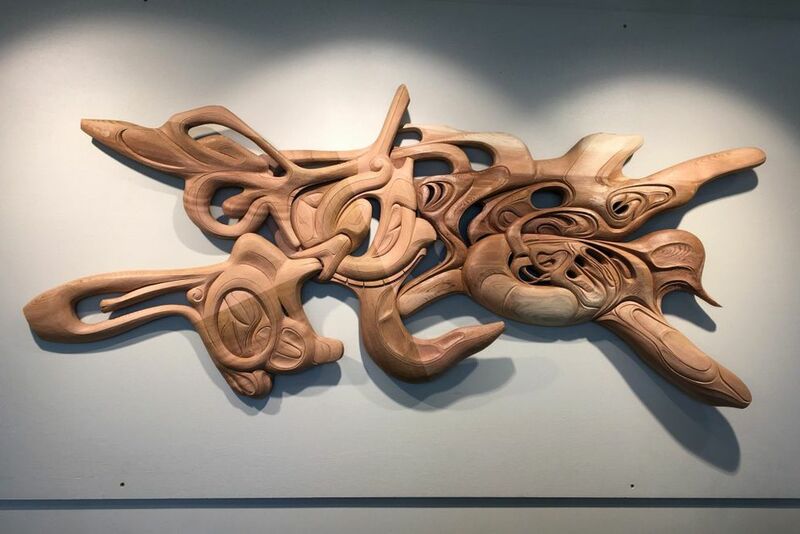 Northrim Bank in Ketchikan is the home for one of the most unusual new pieces of art in Alaska. The large wood sculpture titled "Haa Heists'aa" is by Donald Varnell and Stephen Jackson. It alludes to Northwest formline art, but does it in a way we haven't seen since the late John Schoppert sent purists reeling with his contemporary experiments. For one thing it is asymmetrical. For another, there are gaps of open space in the piece. Furthermore, there are no clear depictions of people, animals or things such as are typically featured in traditional clan art. That's intentional, Jackson told the Ketchikan Daily News. He said art can be limited and "encumbered by the territorialism of clan crest imagery." Given the fact that everyone uses banks, the artists wanted something that would be more "universal." Varnell, a Haida, is perhaps the most avant garde totemic artist now working and Jackson, a Tlingit, is the son of celebrity carver Nathan Jackson. The work is their first collaboration, although the younger Jackson said he and Varnell have been influenced by each other in the past and added that he was looking forward to future collaborations. The Alaska Historical Commission has $100,000 available for matching grants to assist with projects for the commemoration of the 150th anniversary of the purchase of Russian America by the United States. Grants of up to $15,000 each are available for a range of projects including publication, research, art, events and tourism-related activities/ideas. Find out more and download an application at http://dnr.alaska.gov/parks/oha/designations/150Anniversary. Here's the hard part: The deadline for applications to be delivered, emailed or postmarked is 4:30 p.m. on Monday, Oct. 17. (That's the day before Alaska Day for you cheechakos.) They can be delivered to the commission at 550 W. 7th Ave., Suite 1310, Anchorage, AK 99501, faxed to 907-279-8908, or emailed to jean.ayers@alaska.gov. Jean Ayers is also available to answer questions at that email address or by calling 907-269-8694.